LOS ANGELES, CA, AUGUST 29, 2017—Japanese rock outfit VAMPS—featuring HYDE (L’Arc-en-Ciel) and K.A.Z. (Oblivion Dust)—recently announced their return to North America with three shows supporting iconic Misfits founder and punk/rock legend Danzig, as well 2 U.S. headlined dates in support of their current album UNDERWORLD (out via Eleven Seven Music). Today the band announced that they’ll also be returning to Latin America for the first time since 2016 and added four dates to the tour: Mexico City and Guadalajara in Mexico; Santiago, Chile and Buenos Aires, Argentina. Tickets to the shows can be purchased HERE. VIP upgrades for all 4 shows will launch later this week. Coinciding with today’s announcement, VAMPS are also launching the brand new lyric video for their song “BREAK FREE”—Watch it HERE. In other news, VAMPS just added up and coming San Francisco rockers BLACK MAP as support to their September 26 headline show at the Roxy in Los Angeles. BLACK MAP’s current album IN DROVES is their second album and was released earlier this year. Check out the video for new single “Ruin” HERE. 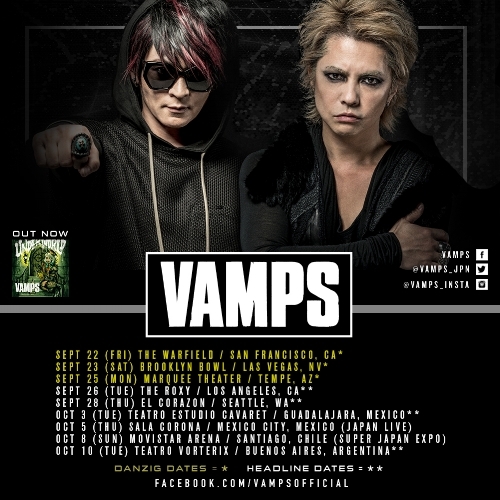 On the upcoming tour, VAMPS will showcase music from their current album UNDERWORLD, which came out earlier this summer and includes hit single, “Calling”—watch the official music video for the track HERE. Purchase tickets HERE. VAMPS VIP upgrades will go on sale later this week!